Ferns grow well outdoors or inside in pots and containers. The lush green foliage is distinctive with the many small leaves on each frond, or stem. Shade loving plants, ferns grow abundantly in the deeply shadowed areas of your garden that other plants shun. Ferns grow well in a variety of conditions and climates—there is a variety of fern available for most any garden. 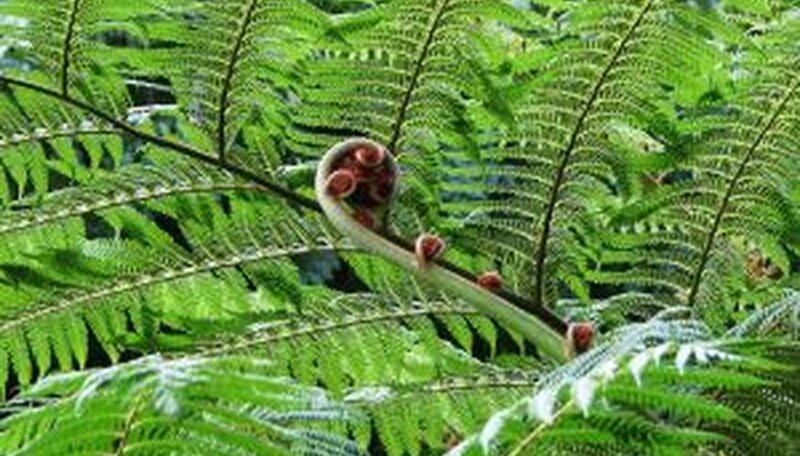 Proper care of your ferns ensures they will be healthy for years to come. Plant ferns in well drained soil or in pots with plenty of drainage holes. Raise garden beds 3 inches by working coarse bark into the soil. The higher beds and the bark improve drainage. Plant the fern shallow in the soil, with the crown of the plant flush with the soil surface. Remove leaves and other garden debris from around the base of the fern regularly. Keep the soil moist but not soaking wet. Use an organic mulch or gravel to retain moisture levels and keep weeds at bay. Water from the base of the plant and avoid getting the fronds wet. Watch the fronds for signs of rot such as browning, yellowing or dying off. Apply a fungicide at the first sign of trouble, and lower the moisture level in the soil with less watering. Remove dead fronds from the plant in the spring, gently snipping them from the base of the plant. This encourages new growth and helps to avoid rot. Divide ferns in the spring and plant the division in pots or other areas of the garden. Create a shade garden with several different varieties of fern.